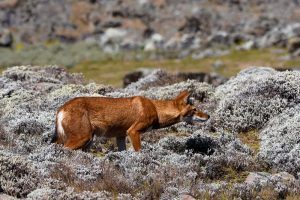 There are 37 canid species in the world, and the Ethiopian wolf, canis simensis, the most rare one of them all, is listed as critically endangered. The wolf has a reddish coat, a bit of white on its throat and legs, and a short black tail. 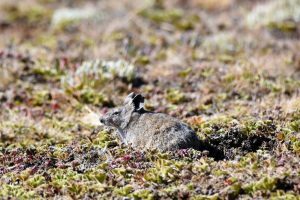 It has an unusually long nuzzle, probably evolved over years of trying to hunt super fast rodents that dive into tiny holes. 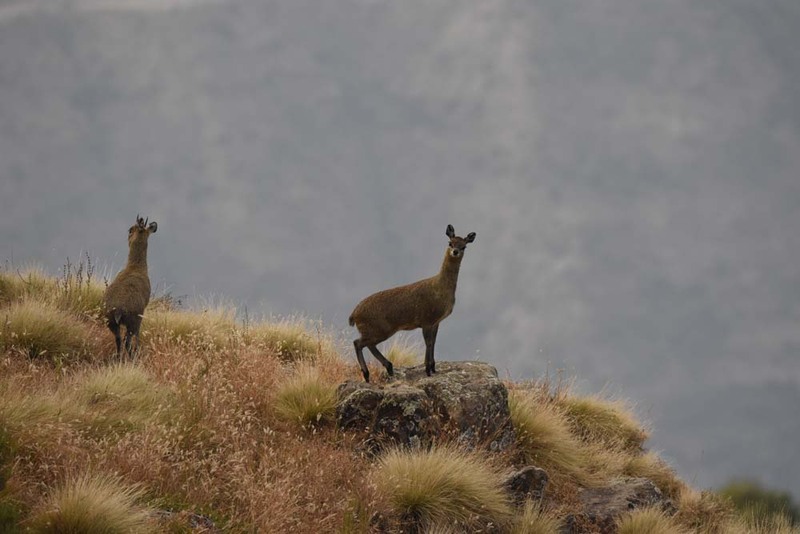 They are approximately 60cm tall and hunt during the day for the rodents that live on the grasslands and Afroalpine moorland found in the high mountain ranges in Ethiopia. 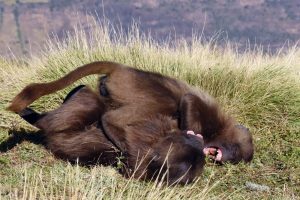 Their biggest threat, apart from habitat loss, is rabies and other introduced diseases by the local dogs. 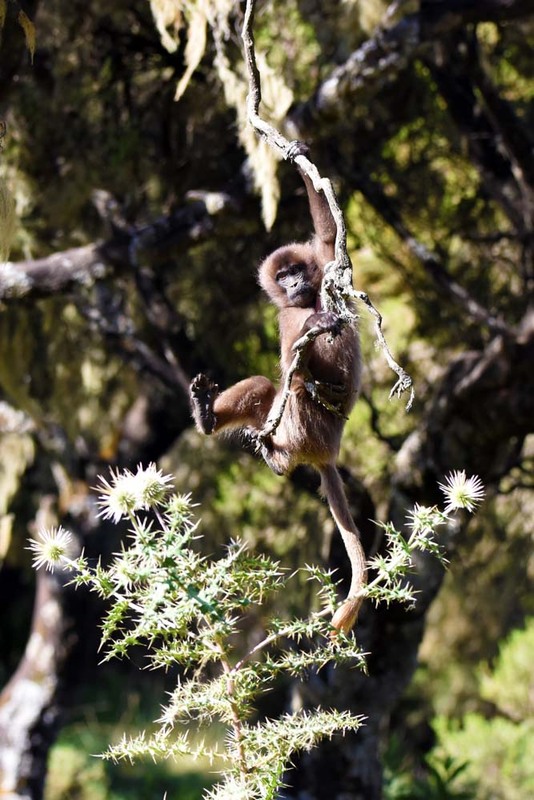 They think only about 450 currently survive in the wild, spread over six isolated locations. 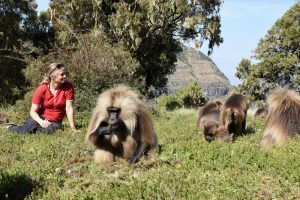 Neither of us had ever seen any wolf, and we would love to see these in the wild, so we had planned a trip to both the Simien Mountains and the Bale Mountains on our tour of Ethiopia, two of the six spots where they still live in the wild. This way we would be giving ourselves the best possible chance to see them. 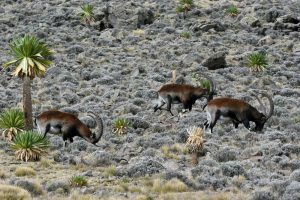 And of course, whilst hunting for the red wolf, we would also try to find as many other animals in these beautiful national parks, including birds. We really wanted to see the wolves of Ethiopia, but of course also the famous Gelada monkeys (not baboons). They eat grass, and sleep huddled together on the steep cliffs beneath the grassy meadows. 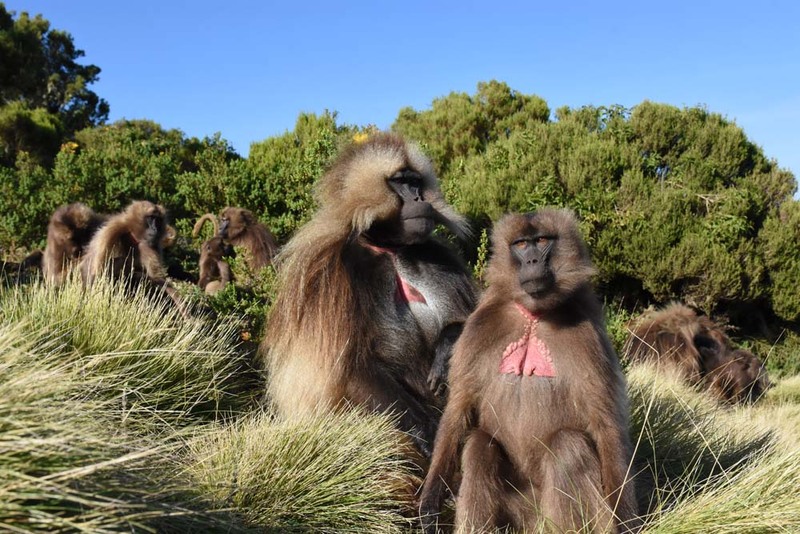 The males have a bright red hourglass patch of skin on their chest and they are very hairy. They sometimes gather in groups of more than 1,000. When they feed, the whole herd slowly moves across vast meadows, continuously plucking and munching the grass, roots and herbs. 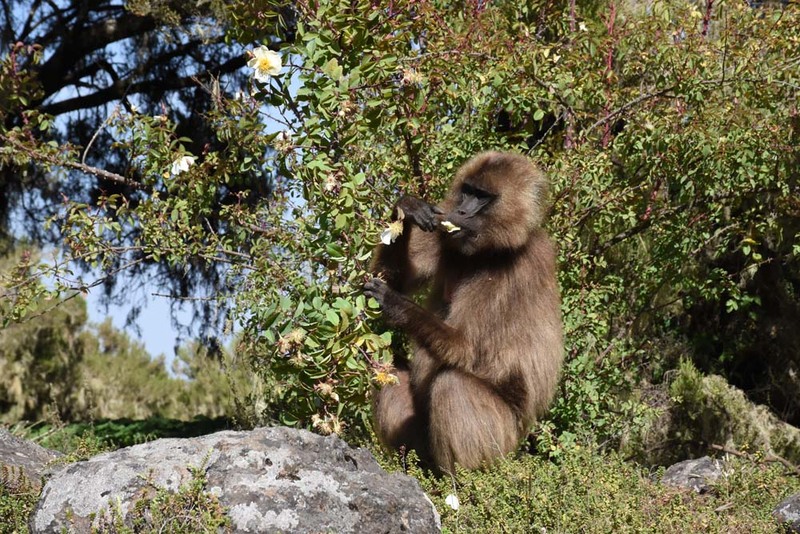 The stronghold of the geladas, with about 4,500 individuals, is in the Simien Mountains NP, also known for its many birds, the highest peak of Ethiopia (Ras Dashen 4550m), the walia ibex, the wolves, and the hiking trails. What most people don’t know is that there are still thousands of people living inside the national park. The Ethiopian government has been slowly moving them out in the last 40 years, but at a rate of a few hundred people every five years or so this is not enough. 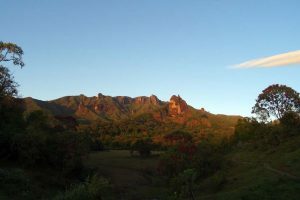 As a result, a huge area of the national park is agricultural land and pastures where cattle graze. It also means that most of the hiking is through villages, and alongside or close to the dirt road that runs through the park. We opted to drive in instead. We hired a specialist bird guide instead of the randomly appointed guide through the guides’ association and it was the best decision. 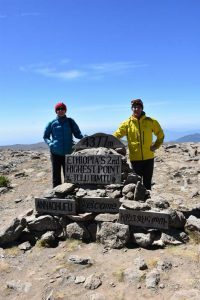 Eshetu was an excellent guide who made our overnight trip. He knew where to look for birds and animals, and being able to tell us everything about them, meant we learned an awful lot. 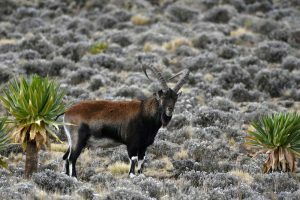 Apart from spotting lots of new birds, he even managed to find the walia ibex, although to be fair, it was our driver Worku who spotted them after Eshetu directed him to the most likely area of seeing them, far beyond the point where most drivers turn around. 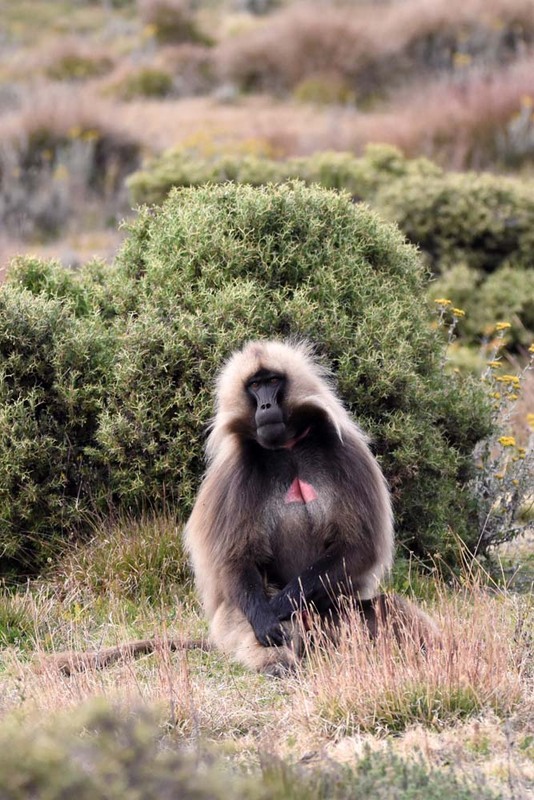 And although we didn’t see an Ethiopian wolf in the Simien Mountains, we did spent a lot time with the geladas. Several hundred of them were grooming each other, before heading off to feed together. We walked and sat in the middle of them, mostly being ignored by the geladas, although the babies would sometimes come and investigate a little closer. It was a magic experience we will never forget. 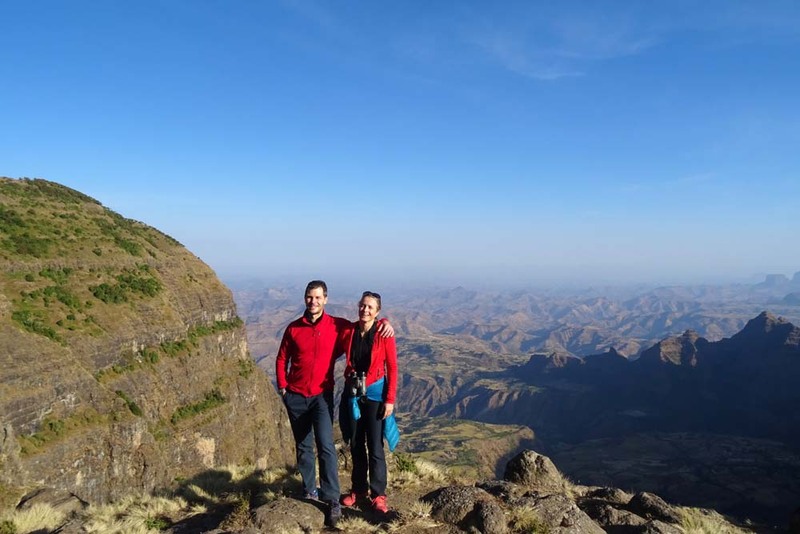 The best guide in the Simien Mountains is Eshetu Belay. He has an excellent knowledge of all wildlife, but is also a superb bird guide and he knows where to find them. His area of expertise is the Simien Mountains, but he would also be able to guide you in the rest of Ethiopia, especially if you are looking for birds. He is super thoughtful and just a very nice person to be with. Contact him via deyu2000@hotmail.com, via Facebook, or via his website. A large national park, around 6,000km2, in the Bale Mountains. 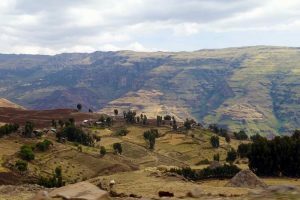 It is home to the world’s largest Afroalpine moorland, the mountain nyala, the unique Bale monkey, and of course the Ethiopian wolf. It was only recently (1974) confirmed that the Bale mountains are in fact the stronghold for the Ethiopian wolves, and not the Simien mountains as was previously thought. 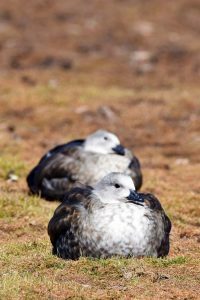 And despite the fact there have ‘only’ been 310 bird species recorded, it is considered to be the fourth best birding site in Africa due to the presence of many endemic and rare species. Like in the Simien mountains NP, a lot of people also still live inside this national park, threatening the survival of not only the animals and the endemic flora, but also posing a major risk to the status of water tower this area has for more than 20 million people downstream of all its rivers. 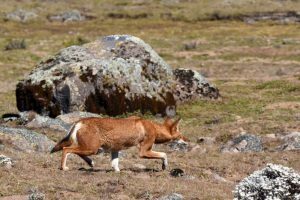 Local dogs roaming free are also a huge threat to the wolves as they interbreed and often spread diseases like rabies, which can wipe out a large proportion of the wolves. 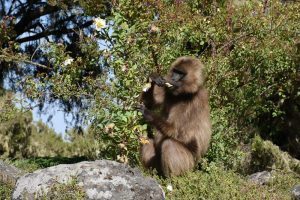 In the Simien Mountains the wolves still haven’t recovered from four major rabies outbreaks in the last 30 years (1991, 2003, 2008 and 2014). 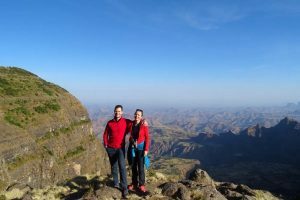 For us it was a chance to unwind, to look for some birds, and hopefully find a wolf or two after failing to find any in the Simien Mountains. 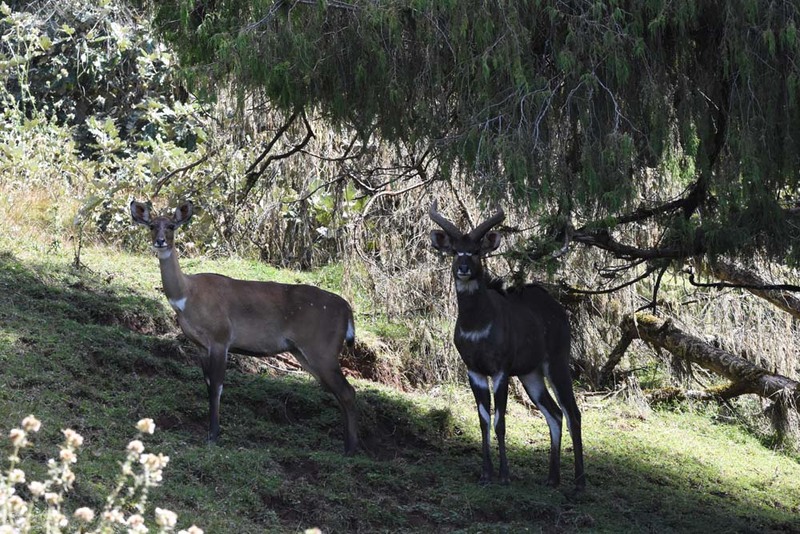 We did some bird walks with a local guide through the forests behind the headquarters of the park, spotting not only some interesting birds, but also the Menelik’s bushbuck as well as the mountain nyala. And explored the montane grasslands of the Gaysay area. 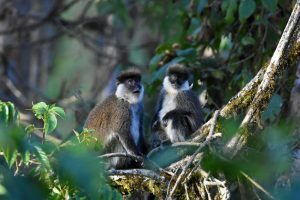 When searching for the Bale Monkey in the Harenna Forest, we saw some more Menelik’s bushbucks and even a giant forest hog quickly disappearing into the thick bush. The Bale Monkeys were difficult to see well, we saw a lot of movement of the bamboo, heard rustling, and caught a few good glimpses of their cute, mustachioed faces in among the thick scrub and bamboo. Towards the end we watched a few of them in the distance, but it wasn’t until we were nearly back at the road that we had some really good sightings as they were grooming each other in a few large trees. But the big question remains, did we find a red wolf? The best place to spot the Ethiopian wolf is on the Sanetti Plateau, an area of around 250km2 of Afroalpine moorland, all located above 3500m, inside the national park. 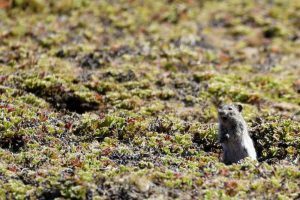 There you will find many different types of rodents living amongst the short heather, the occasional giant lobelia, and the lichen-covered rocks, including the giant mole-rat, the wolf’s main prey. Driving slowly across the plateau we didn’t see any rodents or wolves, so we turned around for another look, and were lucky this time. One wolf in the distance, trotting around, looking for something to eat. 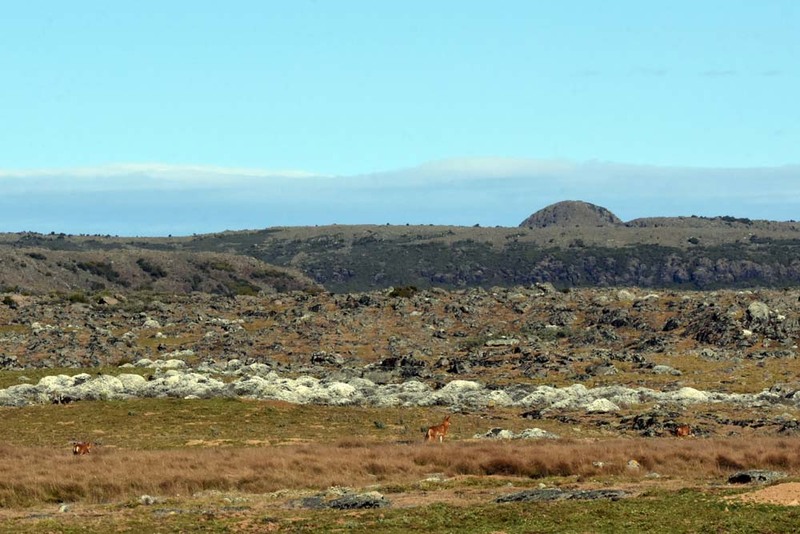 We watched until he disappeared behind a slight rise on the plateau. 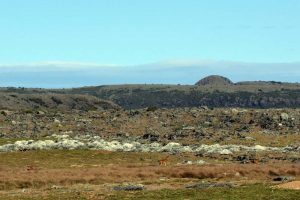 As we continued our search for wolves and rodents, we found a wolf relaxing about one metre off the road, next to a large rock. We followed her for half an hour as she slowly trotted around, sniffing everywhere, occasionally marking her territory, and completely ignoring us as she was looking for food. 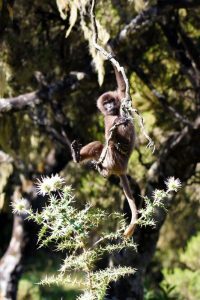 We saw two more solitary wolves, and then a small group of three early in the morning as we were leaving the plateau after a night at the luxurious Bale Mountains Lodge, brought the grand total to seven wolves. It had been an amazing few days in this area, and we wished we could stay longer. This is definitely a place you should add to your bucket list if you have one. 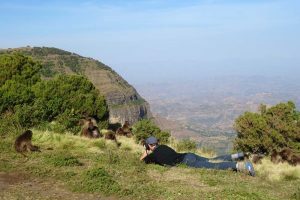 The Bale Mountain Lodge is the best place we stayed in Ethiopia, by far. It is owned and run by Guy and Yvonne, who are great hosts with fantastic stories to share around the fire and dinner table at night. If you are interested in wildlife and birds in Ethiopia, this is the place to be. You can find a lot of information on their website. Wow, you found the wolves! 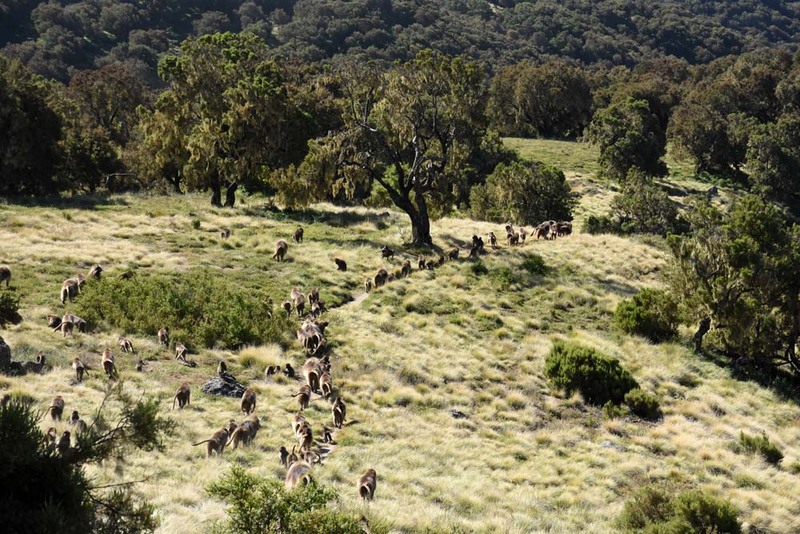 Looking a bit like dingos! Yeah we did! 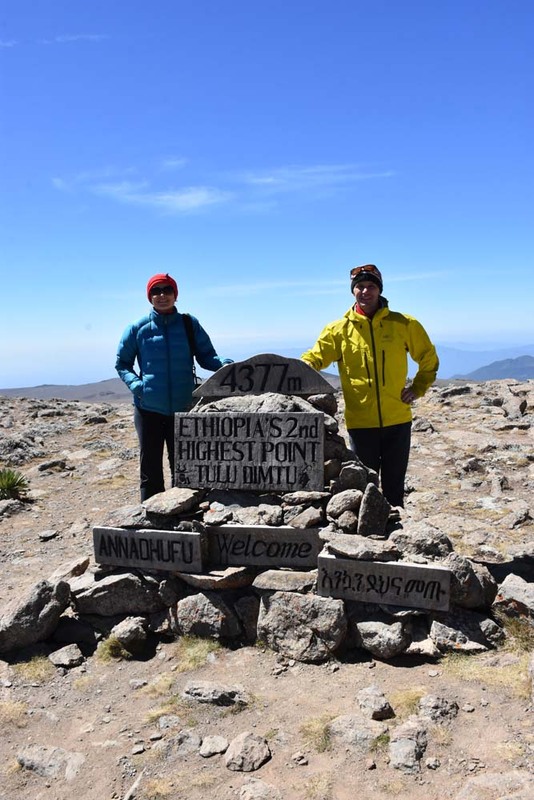 Turns out the best place was the Bale Mountains! If you spend a few days there you will (almost) definitely see them…!